Andrey & Julia Dashin’s Foundation is celebrating its 2-year anniversary with an atmospheric concert under the stars. 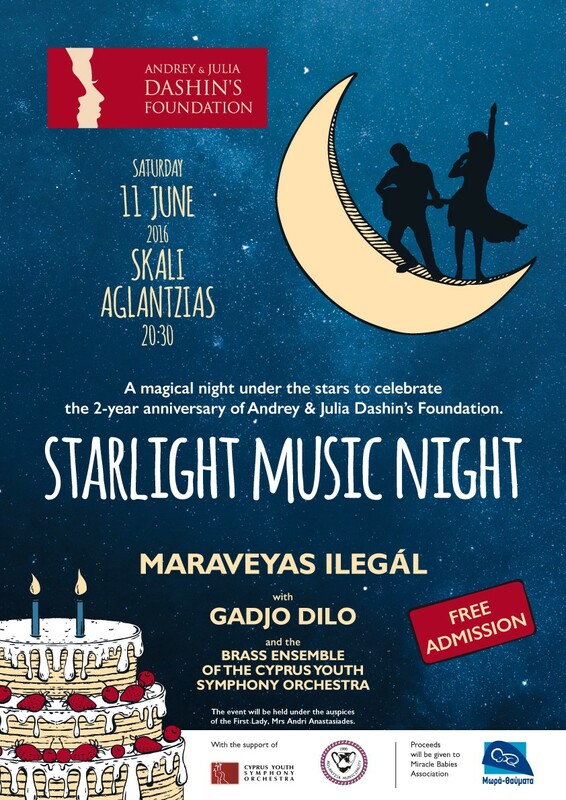 Andrey & Julia Dashin’s Foundation is celebrating its 2-year anniversary and invites everyone to join them for a magical evening, under the stars, with music in the spotlight and absolutely no entry fee. This inspiring foundation, launched in Cyprus in 2014 by Andrey and Julia Dashin themselves, has already helped families and children in need, as well as local communities. This has been their mission since the very beginning, and today, more driven than ever, they extend their helping hand to contribute to the cultural offerings of the island and respond to needs of people across Cyprus. The event will be opened by the outstanding Brass Ensemble of the Cyprus Youth Symphony Orchestra followed by the swinging gipsy sounds of Gadjo Dilo, who will be succeeded by folk rock artist Maraveyas ilegál who will perform his hits, inspired by the music of the world. Julia Dashina, one of the founders, said: “We are excited that Andrey & Julia Dashin’s Foundation completes two productive years full of successful initiatives and actions to support the Cypriot society. And because celebrating is all about sharing, we would like to share our enthusiasm and our passion to give back, with all of you, through this high quality event that can be considered a contribution to the island’s cultural events this summer”. All proceeds collected from fundraising activities during the evening, will be given to the Association Miracle Babies, which aims to raise awareness about premature babies and to support the Neonatal Intensive Care Unit of the Makarios Hospital. The event, taking place on Saturday June 11th 2016 at Skali Aglantzias, in Nicosia, at 20:30, will be held under the auspices of the First Lady, Mrs Andri Anastasiades. Admission to the concert area is free to all and seating will be strictly on a first-come, first-served basis.